Location: Various locations within the city centre - currently Civic Square. Visit an art gallery with a twist this spring in Canberra’s city centre – the ANCA Art Bus. Experience an iconic Canberra Action Bus repurposed into a mobile gallery space that will play host to exhibitions by local contemporary artists. Each artist will take over the ANCA Art Bus for a month at a time. Find out more about the artists below. Dionisia Salas has been working with repeated marks and pattern in her work and has experimented with this through painting, silkscreen printing, burning techniques into paper surfaces, and collage. She has been experimenting with how formal investigations in abstract mark, colour, pattern and composition can result in the artwork being a document of its own making. The art bus will be in City Walk throughout December. Tom Buckland is an Australian based sculptor and multi-media artist with a strong focus on making and materiality. Buckland’s work plays upon audience interaction using installation and sculpture to transport the audience into other worlds that darkly mirror our own reality, questioning contemporary human relationships with technology, animals and the environment. The art bus will be in Civic Square, out the front of the Canberra Theatre throughout January. A retired Transport Canberra bus transformed into a contemporary gallery and studio space opens to the public today. ANCA Gallery and Studios received a City Grant from the City Renewal Authority for this gallery with a twist. The ANCA Art Bus will showcase contemporary art by local artists and hold interactive art workshops at three different sites across Civic from November 2018 to January 2019. ANCA Art Bus co-ordinator Millan Pintos-Lopez said the space was designed to allow people to interact with Canberra’s local artists in a unique setting. “Each month the ANCA Art Bus will host a different artist, who will use the bus as a studio while also showcasing their exhibition,” Mr Pintos-Lopez said. “I encourage everyone to get on board to view the exhibition, chat to the artist or book into one of the free art workshops that will run regularly throughout each month. City Renewal Authority director design and place strategy Andy Sharp said the ANCA Art Bus was an opportunity to use public spaces around Civic in a unique way. “The art bus is an exciting project that will bring life to different public spaces around Civic,” Mr Sharp said. “Throughout the month of November the bus will make Garema Place more fun, colourful and entertaining before moving on to inject this spirit into another of our public spaces. 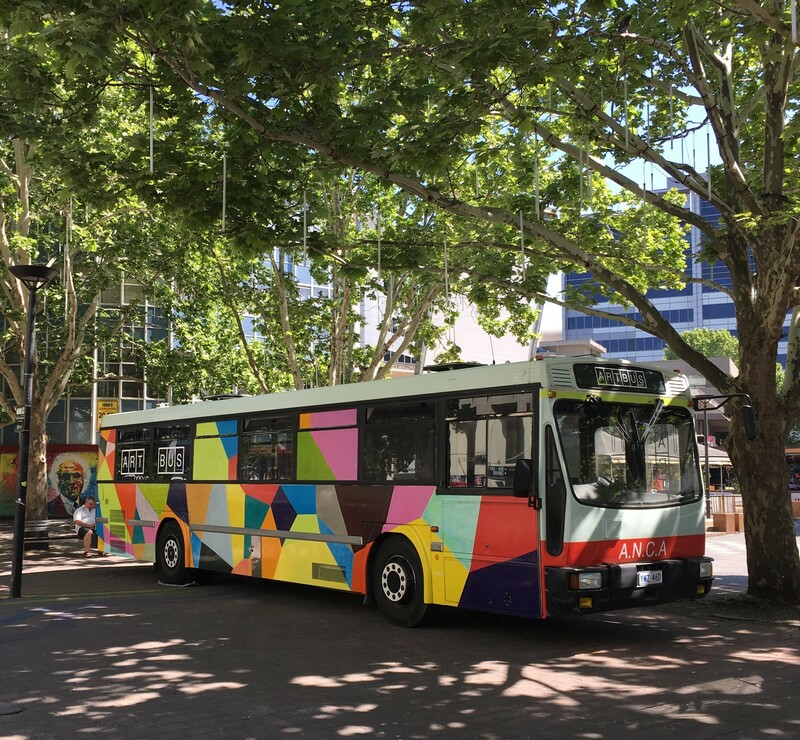 The ANCA Art Bus will have month-long stays in Garema Place, City Walk and Civic Square. It will be open Wednesday to Sunday each week from noon to 5pm. The workshops will be held Saturdays and Sundays from 2pm. To keep up to date, follow the ANCA Art Bus travels on Facebook or via Instagram @anca_art_bus. The City Renewal Authority’s City Grants are funded through the City Centre Marketing and Improvements Levy.